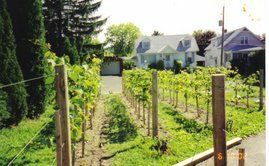 Backyard Vineyard & Winery: Wine Cellar Fever! It's March 8th and I'm so frustrated with our weather report which is calling for the coldest weather of the year so far. A bone chilling -4 F is predicted for tonight accompanied by howling winds. These temperatures are far below the normal averages for this time of year, so much for global warming. It's definitely that time of year in the Northeast when you can't take the weather anymore. Everyone has "cabin fever". 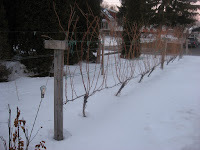 But for wine growers who would love to be outdoors tending the vines now, it's even worse. You've been spending all of your free time in the cellar racking, fining and bottling wines that are aging. You look out the window and see your vines buried under a layer of snow, the winds whipping and you just wonder why you live here. Out west and in the temperate parts of the country and world, pruning is well underway or long finished. Thoughts of a mild April breeze carrying the smells of spring fill our minds now. The feeling of the warm spring sun on your face, the smell of earth, grass and the fragrance of early spring flowers filling your nose as you prune away. We live for days like these. 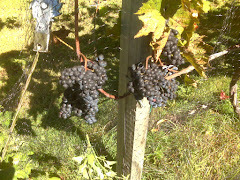 The vineyard looks so clean, open and neat after you prune. As the sun begins to go down and the spring air takes on a chill, that's the perfect time to get a fire going and start tossing in the pruned canes. Warming yourself by the fire with the sweet smoke from the burning canes in the air, is the perfect way to end a long awaited spring day such as this. Except maybe for the glass of wine that awaits you back inside. Oh well, those days will be here soon, just not soon enough for me!